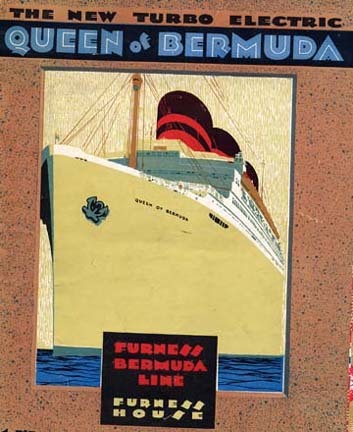 For decades the Furness Bermuda luxury liners were synonymous with the island’s tourism industry — the “Millionaires’ Ships”. In 1919 Furness Bermuda Line had been awarded the mail contract for the New York to Bermuda service. 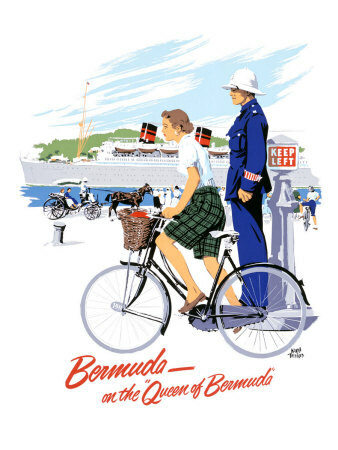 This service reached its peak in the years just before the Second World War when Furness Bermuda Line built two magnificent luxury liners to serve the island – the “Monarch of Bermuda” and the “Queen of Bermuda” [pictured]. “They were both built by Vickers Armstrong Ltd, Walker on Tyne, England, UK,” said Michael Grace in a history of the ships. Passengers who sailed aboard the Furness Bermuda ships at the time included such Hollywood stars as Shirley Temple, Cary Grant and Clark Gable. “The two sister ships sailed on three week cruises from New York to Bermuda for Furness-Bermuda Line,” said Mr. Grace. The run between New York and Bermuda took only 40 hours in each direction, allowing for four days to be spent on the island. As Bermuda became a major tourist destination for North Americans, the Furness Withy Line made substantial investments in Bermuda’s holiday facilities, including the Mid Ocean golf club, the St. George, Bermudiana and Castle Harbour hotels and two tenders to carry passengers from ship to hotel. “There were few ships better than the ‘Queen of Bermuda’. She was a true favorite,” said Everett Viez, a well-known maritime historian. “She had more luxury about her than many transatlantic liners. The 22,500-ton, 580-foot long ’Queen of Bermuda’ was completed in 1933. Her near-sister, “Monarch of Bermuda”, had entered service in 1931. Along with splendid public rooms, a large main restaurant, an indoor pool and spacious sports and sunning decks, she boasted a great novelty for that era: every cabin had a private bathroom. The “Monarch” and “Queen” sailed in regular tandem up to the summer of 1939 when war broke out in Europe and they were called to more urgent duties. When the Second World War broke out the two luxury liners were requisitioned by the United Kingdom for war service. The “Monarch of Bermuda” served as a troopship while the “Queen of Bermuda” became an Armed Merchant Cruiser and later a troopship. Sadly after the war while being refitted for passenger service the “Monarch of Bermuda” was gutted by fire. She was salvaged by the UK Ministry of Transport and converted into an emigrant liner. Renamed “New Australia” she was sold in 1958 to Greek Line and renamed “Arkadia”. Eventually she was retired from service in 1966 and sent to be scrapped at Valencia in Spain. 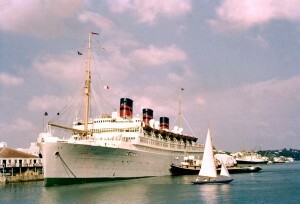 But the “Queen of Bermuda” did return to the Bermuda service after the war in 1947. 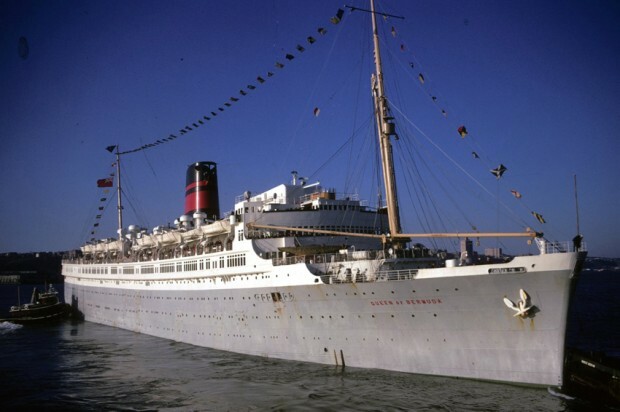 And in 1951 the Vickers shipyard completed “Ocean Monarch”, which ran with “Queen of Bermuda” to the island until Furness Withy withdrew from the passenger service. 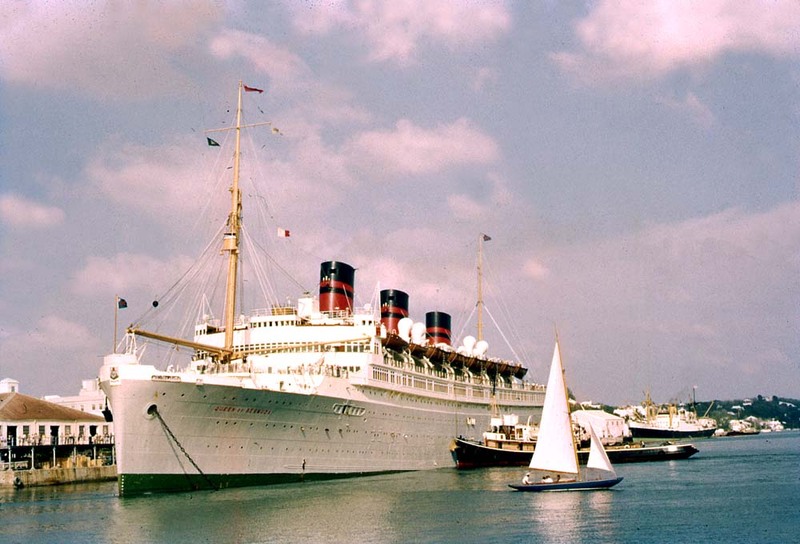 In 1961 the “Queen of Bermuda” was completely modernised and rebuilt with just one funnel. But by this time the heyday of Furness Bermuda Line was over. By 1966 the company decided to drop the New York to Bermuda run. Bermudians who served aboard the Furness ships have been invited to attend a reunion of the ships’ crews being held in the UK next month. Members of the international Furness Bermuda Line association are staging the event at The Merchant Seaman’s War Memorial Society in Surrey on May 14. Guest speakers will include Bermudian marine artist Captain Stephen Card who collaborated with author Piers Plowden on a definitive history of the “Queen of Bermuda” and her sister ships published by the Bermuda Maritime Museum. ONE OF THE FIRST POST WAR CREW MEMBERS–BELL BOY LED BY SYDNEY WHEAVER–CHIEF STEWARD.